View More In USB Gadgets. Indicator Light: red light in working or charging status; blue light in full charged status. 【PORTABLE DESIGN, SOUNDLESS TECHNOLOGY】: adopting ultra quiet motors, the fan produces little noise while working. 4 inch size and lightweight, it's easy to carry around so as to enjoy freshning summer. 【ULTIMATE CONVENIENCE, LONG TIME WORKING HOURS】: With the USB charging cable, the fan works with USB charger, laptop,computer, power bank and other USB-enabled devices. It also works-2-8 hours with the high quality rechargeable LG Lithium Battery. 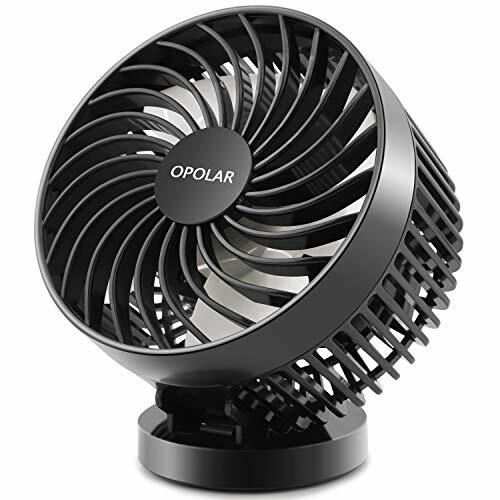 【ANGLE ADJUSTABLE BLOW AND STEPLESS WIND】-: the fan can be adjusted from 0°to 30°vertically. Multi-speed adjustable power fan, you can adjust the speed low to high as your will with the stepless speed regulation technology. 【EASY TO CLEAN】: the detachable cover ensures this item stays clean and it is easy to maintain The irremovable battery offers more safety. If you have any questions about this product by OPOLAR, contact us by completing and submitting the form below. If you are looking for a specif part number, please include it with your message.